Told you there'd be more so here is number 2. Layout two of the lift to the top of the cathedral and post two in one day. Putting things away now and doing the supermarket run. (Inspiration from Kaiser). Oh wow, these papers are perfect for this lovely photo. How was the shopping? Not as elegant or grand as your page, I expect! 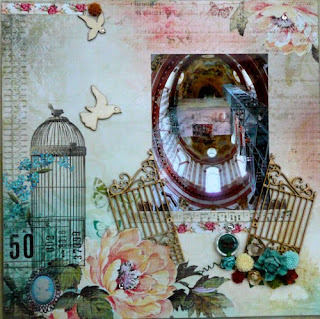 Two lovely layouts using those lovely papers, your photo's are go perfectly. Fab photo, combined with a beautiful LO! I love the arrangement of embellishments. Gorgeous page Karen, that photo is perfect for the papers and the little gate.